Hope everyone had a wonderful Memorial Day. We were out of town at daughter number 1's house. So the only sewing that I got done was on the hexies. I have a couple more point sew on, it's getting there very slowly!! Check out the linky parties on the side bar, lot of eye candy and inspiration out there. I love to travel with my hexi's too! Yours are looking great Sue! Looking good Sue, how big is this tip to tip? 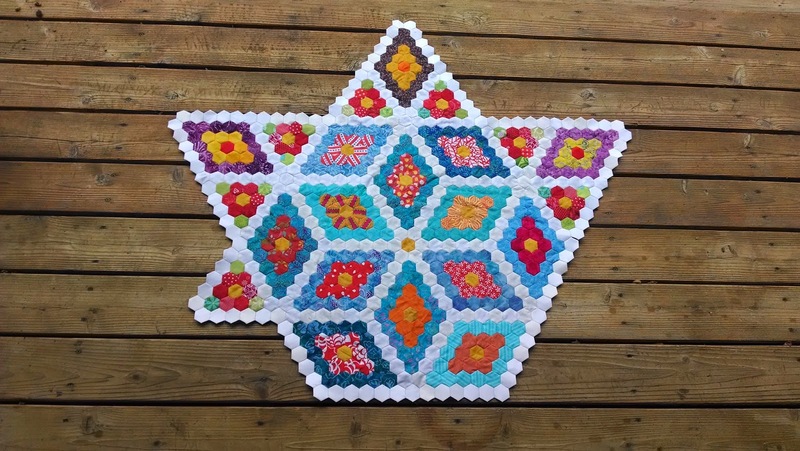 Lots of hexies going on right now, and yours are some of my favorites! Love the happy colors! Wowsers doesn't quite cover it! That's beautiful and vibrant. This is such a great layout for hexies. Oh my what a glorious quilt. The colors are sparkling and it looks so cool and shady. What a wonderful quilt. Keep up the good work! I'm assuming that is EPP, looks beautiful. That is just lovely so far! Beautiful. I must get my EPP out again. I recently bought a lozenge template, looking forward to playing with that! So beautiful! My hexies traveled to Florida with me last summer (from Newfoundland) and this summer they'll get to go camping. Then I should be finished this epp project and looking for a new one! Sue this is insanely gorgeous, I can only imagine what it will be like when you're finished and you use your mad quilting skills on it!!!! I need to get back to mine. Yours is stunning!!! Love all those bright colours against the white, Sue. And those cute little flower blocks around the star. Looking great! Lovely hexie project you've got there. Gorgeous. Now where have you decided to put the yellow diamonds you made? Just curious. And thanks for linking to Hexie Weekend! Did you know you can create short links with AdFly and get $$$$$$ for every visit to your shortened links.